Rain or shine, Arayot’s doing just fine! 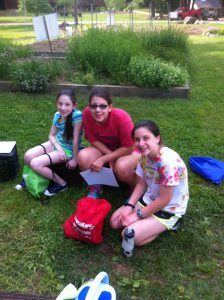 The excitement of the first day of camp never left our chanichims’ (campers) spirits as they welcomed in Shabbat with beautiful songs. They also enjoyed an amazing Shabbat meal which included chicken soup and matzah balls. 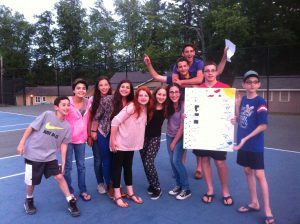 But after aruchat erev (dinner), Arayot was still hungry for more ruach (spirit), so they continued to chant during zmirot (tunes) time, singing and dancing the night away with the rest of upper camp before getting a good night’s rest. Waking up to the smell of some tasty nishnush (snack) on Shabbat morning, Arayot then helped lead the Torah service in both the traditional and egalitarian minyanim before breaking for breakfast. After a beautiful rendition of mussaf by Joel Sussman and some great laughs from Parsha Players, B9 helped celebrate Doug’s and Nate’s birthdays with ice cream. On Shabbat afternoon, the chanichim played sports, hung out under the shady trees, and swam in the agam (lake) before engaging in some thought provoking sichot (discussions). At the end of Shabbat they feasted on some delicious mac n’ cheese and enjoyed a wonderful havdallah ceremony and joyous Saturday night dancing. Sunday washed away the weekend (literally), but that didn’t stop Arayot from starting their practice for their ketsev (rhythm) performance on July 9th! This week, Arayot will prepare for their own talent show, and take on all the exciting adventures that Loon Mountain has to offer! Stay tuned for more updates and news, keep it chill!